As is the case with all new Windows 10 feature releases, some features have either been removed outright from the new version or put on hold for removal in a later version. Tip: check out the removed and deprecated features of Windows 10 version 1803 here. The removed features in the October 2018 Update won't affect many users; it may have an impact on some businesses and Enterprise customers. There is no big impact change such as the removal of the Homegroup feature of the April 2018 Update for Windows 10. No word on classic Paint which Microsoft listed as deprecated when it released the Fall Creators Update in 2017. Paint will be removed but Microsoft revealed that it would move the app to the Windows Store so that users who wanted to use it could download and install it that way. Microsoft lists three deprecated features that are no longer in active development. These features or tools won't be removed in Windows 10 version 1809 but they won't receive any updates either. Microsoft will remove these eventually from the operating system. The company lists Companion device dynamic lock APIS, replaced by Dynamic Lock, and OneSync service, taken over by Outlook app syncing, as no longer in development. 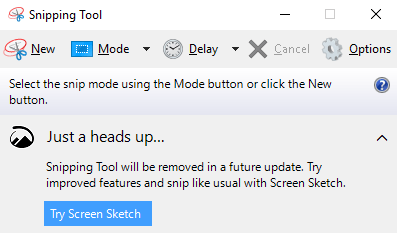 Probably the most popular of the deprecated features is the Snipping Tool which Microsoft plans to replace with the upcoming Snip & Sketch application that it will introduce in Windows 10 version 1809. You can check out Microsoft's listing of removed and deprecated features on the company's Docs website. Feature removals in Windows 10 version 1809, the October 2018 Update, should not affect lots of Home users. The removal may affect business workflows, however. Now You: are you impacted by these changes? The article lists the removed and deprecated features of the October 2018 Update release for Windows 10 (Windows 10 version 1809). The biggest over bloated massive collection of useless features, ready to mess and destroy again everything you have fixed over the last six months, with tons and tons of cumulative updates of low quality crap. Complete ISO upgrade releases twice per year are the definitive nail in the coffin of the user’s patience. My father is stuck in W7 and I admire his everyday happiness. You can also be happy as him, just install cumulative updates when they are released and lock your PC to v1709 which for me is the last Windows version that will ever be installed before going fully to Linux. On one of my PCs 1709 to 1803 kept failing. I did a factory reset to the original 1511, then I used the Windows 10 Media Creation Tool to make a USB installation drive. I upgraded from that straight to 1803 in one go, missing out 1607, 1703 and 1709. 100% true. I am on Win7 without any problems. I am pleased ClearType will be the Windows 10 1809 default. I have four Windows 10 PCs. One serves as media server for playing recorded TV and home videos. It is connected to my TV as its only screen and is turned on only when I want to use it. I had disabled the Windows Update service, and for 15 months I was not plagued by any updates. Then one day I and the family sat down to watch a film recorded via a TV tuner on my main desktop PC. It came up with a message, that a restart was required, and since it had not been on for some time, the computer would restart in about 50 minutes time. Knowing that a restart would probably mean the PC would be unusable for an hour or more, I set a restore of an image backup running. This takes about 15 minutes during which time I turned off the ISP connection. Then we watched the film. Later I configured it on a static IP on the home network with no gateway of DNS addresses. That PC is still running version 1511. The next PC is in the process of being moved from Windows 10 to 8.1. The other two have had upgrade problems. One from 1703 to 1709, which took three attempts, and the other from 1709 to 1803 which failed six times and I eventually had to go back to the factory state and upgrade from a Windows 10 version 1803 UBS drive. To me, Windows 10 should be deprecated and removed. SNMP missing from the removed features list.